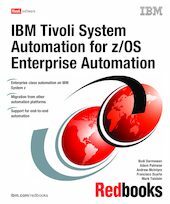 This IBM Redbooks publication provides an overview of IBM Tivoli System Automation for z/OS concepts and new features. We also discuss some considerations on migrating non-IBM products to IBM Tivoli System Automation for z/OS. The discussion is primarily aimed at technical professionals that are looking to understand the IBM Tivoli System Automation for z/OS new features and find migration options. This book explains some important features of IBM Tivoli System Automation for z/OS, including using the Processor Operations feature, integration with IBM Tivoli OMEGAMON Classic, and integration with End-to-end automation feature of the IBM System Automation for Multiplatform. We will also discuss the available services from the Software Migration Project Office that provide migration services for mainframe based products, including IBM Tivoli System Automation for z/OS, in this new implementation of IBM Tivoli System Automation for z/OS. We also provide some overview of the migration procedures from non-IBM products.